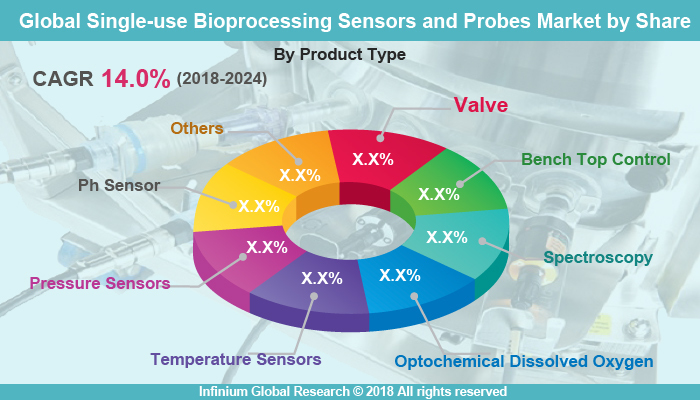 A recent report published by Infinium Global Research on single-use bioprocessing sensors and probes market provides in-depth analysis of segments and sub-segments in global as well as regional single-use bioprocessing sensors and probes market. The study also highlights the impact of drivers, restraints and macro indicators on the global and regional single-use bioprocessing sensors and probes market over the short term as well as long term. The report is a comprehensive presentation of trends, forecast and dollar values of global single-use bioprocessing sensors and probes market. According to the report, the global single-use bioprocessing sensors and probes market is projected to grow at a CAGR of 14.0% over the forecast period of 2018-2024. A single-use sensing technology offers a better quality of measurement than traditional, reusable sensing technology. The process monitoring and control to a bioprocess procedure provide easier adoption of the quality by design (QBD) initiative that emphasizes getting of product quality through process understanding, monitoring, and control. The use of single-use technology (SUT) to meet the drug shortage worldwide is likely to drive the growth of the market. To meet the clinical trial timelines and sustaining losses biopharmaceutical companies are facing challenges which can be solved by switching to SUTs. The companies that have implemented and switched to a single-use system benefited with improved production efficiency, lower costs, and reduced overall contamination rates. Furthermore, SUTs reduces the production turnaround time and allow continuous manufacturing. The benefits of SUTs will increase the demand for the single-use bioprocessing system market in the coming years. On the other hand, environmental concerns and technical issues in the use of single-use sensors are likely to hamper the growth of the market. Development of different type of bio-sensors for bioprocess monitoring can further create lucrative opportunities in the near future. North America is expected to be the largest market for single-use bioprocessing sensors and probes followed by Europe. North America accounted for the highest market share in this region owing to pro-activeness in adopting new technologies and the presence of major biotechnology and pharmaceutical industries. The Asia Pacific is expected to grow faster due to the adoption of advanced technologies and development of the biotechnology sector is likely to drive the growth in this region. The merger and acquisition, extensive investments on R&D to innovate the technology and for manufacturing of the novel product is the key strategy of the key vendors in this market. The report on global single-use bioprocessing sensors and probes market covers segments such as product type and application. On the basis of product type, the global single-use bioprocessing sensors and probes market is categorized into the valve, bench top control, spectroscopy, optochemical dissolved oxygen, temperature sensors, pressure sensors, pH sensor, and others. On the basis of application, the global single-use bioprocessing sensors and probes market is categorized into biotechnology, pharmaceutical, academic research, and others. The report provides profiles of the companies in the global single-use bioprocessing sensors and probes market such as Parker Hannifin Corporation, Hamilton Company, Thermo Fisher Scientific, Inc., Sartorius Stedim Biotech S.A, Honeywell International, Inc, Eppendorf AG, GE Healthcare, Broadley-James Corporation, Polestar Technologies, Inc. and Others. The report provides deep insights on demand forecasts, market trends and micro and macro indicators. In addition, this report provides insights on the factors that are driving and restraining the global single-use bioprocessing sensors and probes market. Moreover, IGR-Growth Matrix analysis given in the report brings an insight on the investment areas that existing or new market players can consider. The report provides insights into the market using analytical tools such as Porter's five forces analysis and DRO analysis of single-use bioprocessing sensors and probes market. Moreover, the study highlights current market trends and provides forecast from 2018-2024. We also have highlighted future trends in the single-use bioprocessing sensors and probes market that will impact the demand during the forecast period. Moreover, the competitive analysis given in each regional market brings an insight on the market share of the leading players. This report will help manufacturers, suppliers and distributors of the single-use bioprocessing sensors and probes market to understand the present and future trends in this market and formulate their strategies accordingly.